We operate as a nonprofit, grassroots marketing organization headed by a board of elected winery members. Our goal as an organization is to educate both visitors and our own community about the wine and wine industry of Paso Robles' 46 West, as well as help raise funds to support other local nonprofit organizations. Our primary method of fundraising is through events, open to both the general public, and wine industry insiders. Our events range from semi-annual ''mini wine festivals''—like our 46 West block parties—to multi-winery, self-guided tasting tours. 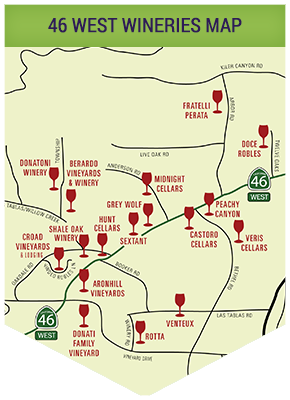 Whether you’d prefer to enjoy the lively atmosphere of one of our annual wine events, or the gentle pace of a self-guided tour from winery to winery, the 46 West Wineries have something for everyone.